The ten-day rollercoaster ride appears to have finally come to a close for Dave Dombrowski and Red Sox fans alike. 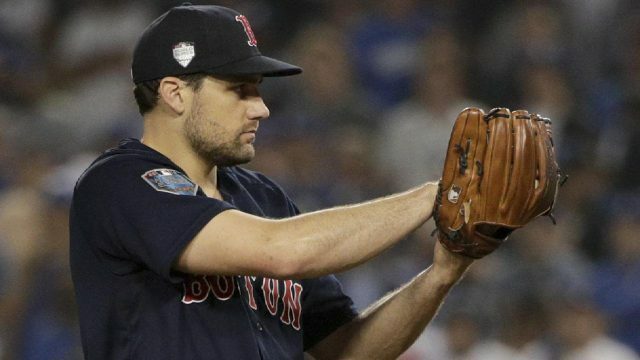 Playoff-hero and certified Yankee killer Nathan Eovaldi has come to an agreement to re-sign in Boston for the next four years, pending a physical, according to The Atheltic. Eovaldi is expected to make roughly $70 million over the course of his new contract, which to some may seem like a lot of money. Think of it as essentially giving Eovaldi the qualifying offer for four seasons, and that’s the projected annual value. However, with the beauty of contract manipulation, the Red Sox could always backload this contract, which means they can still make significant moves within their bullpen, as well as have luxury flexibility to make a strong push to extend the likes of Chris Sale, Mookie Betts, and Andrew Benintendi. But if one thing was for certain going into this off-season, it was that Dombrowski had no intention of letting anybody else get their hands on the 28-year-old—who went 3-3 with a 3.33 ERA in 12 outings in Boston last season, as well as going 2-1 with a 1.61 ERA in six postseason outings, including two starts. It was fairly certain he’d get a significantly big contract which caused the Red Sox to overpay for him a little bit. That being said, considering the Red Sox appear to not be interested in re-signing Craig Kimbrel, there is also the possibility of Eovaldi coming in and becoming the Red Sox closer for the duration of this four-year deal. Remember, this man can get his fastball up into the triple digits, touching 102 MPH in his relief appearances during the playoffs—plus he’s got his wipeout cutter that can get as high as 96 MPH on the radar gun. He has elite closer potential, which is why MLB Network and Fox Sports commentator, John Smoltz, sees this as a realistic possibility. Until the terms of the contract are released, there’s no real way of predicting what the next move for Boston will be. They’ve been linked to the likes of David Robertson and Zach Britton, who both played for the Yankees in 2018 and are projected to make around $11 million per season, so who knows? But for now, let’s focus on the fact the Red Sox knew who their guy was, and they made sure nobody else could take him away.